At the General Conference Annual Council meeting in October 2016, several people told me that Nancy Wilson, wife of Elder Ted Wilson, needed to talk with me right away. Later that day, we met in the foyer of the General Conference building, and she excitedly told me about a book that needed to be translated from German to English. She told me that it would be a powerful book in English. She was right. The result of that conversation is Longing for God by Dr. Frank Hasel, associate director of the Biblical Research Institute at the General Conference. This powerful prayer journal is filled with spiritual insights as well as practical ideas for making your prayer life more fulfilling and drawing you closer to God. How did you get involved in prayer journaling? Actually, I am not a great journaling person. Never have been. I did some occasional prayer journaling many years ago when I was much younger, but I didn’t continue on a regular basis. I started journaling again about eight years ago, after experiencing a significant loss in my life when my wife died of breast cancer in 2009. I came across another prayer journal that inspired me to pray in a more meaningful way using the words of Scripture, and that helped me in my own spiritual walk with Jesus. It became the inspiration for writing my book, Longing for God. How did prayer journaling help you in this extremely difficult time in your life? I practiced the very things I write about in my book. These are things that are tested and tried in my own experience—things that helped me as a single parent, working full time, to stay spiritually sane and even joyful by focusing on God rather than getting bogged down by my problems. What do you find that keeping a prayer journal does for you personally? In what ways does it affect your life? Your walk with God? I find that keeping a prayer journal is an exercise against spiritual forgetfulness. To write down encouraging promises or spiritual insights while reading the Bible helps me to fix them more firmly in my mind. To write down my prayers reminds me of my spiritual priorities and what is really important. A prayer journal like I describe in Longing for God is a wonderful tool to help me remember the many blessings, small and great, that I have received over the past months, and to recount them. It also helps me not to forget how God has led me in the past. To go back and read in my journal where God has answered prayer and how He has done it is a great source of encouragement and a strong motivation for me to continue to trustingly approach God in prayer. All this fosters an attitude of great gratitude and helps to make me a more joyful and hopefully also a more pleasant person. And it lifts me up to see that God did not leave me alone, even during those times when I had my questions or had to face challenges or struggled with discouragement. Journaling helps me to be more attentive to my own spiritual needs and to the needs of others. When do you find is your best time to pray and journal? I find the best time for me to pray and to journal is time that is undisturbed. Sometimes I deliberately have to switch my Smart phone to silent flight mode or even disconnect from the Internet for a while to connect with God and make those precious moments happen. I also find that I have to plan for such quiet time. Often it does not occur just by itself. If I want to have it, I need to schedule quality time and even have to be willing to cancel a few things in my busy schedule, if need be, to make room for it. If the weather permits, I enjoy prayer walks in a nearby park where I am surrounded by the quiet sounds of nature. Ideally, for me the best time to journal and pray is in the morning before the hustle and bustle of the day starts. But then I also need the self-discipline to get up early enough when the day begins and to get to bed early enough to make this happen. What advice would you have for someone who would like to keep a prayer journal but who has difficulty putting their thoughts on paper? I would say: Why don’t you give it a fair try? Nobody expects you to write like a Nobel laureate. This is a learning process. It is better to start humbly and with just a few words than not to write at all. And remember: You don’t have to show what you wrote to anybody. It is your personal journal of your own journey with God. But writing down your thoughts has an amazing ability to clarify and order your thinking! And who knows, perhaps there will be even some precious gems to share with others, after you have practiced journaling for some time. Journaling does not mean that you have to write loooong entries every day. Often a short sentence is all it takes to write down something that has come to your mind or that is precious to you, or something that you are thankful for. We sometimes say that God always answers every prayer—with "Yes," "No," or "Wait and Trust." As a theologian, how would you answer someone who says that view is basically meaningless—a rationalization that allows us to explain away prayers that seemingly have no results. Often, we are too focused on prayer as an exercise to get something from God. As if it is God’s sole responsibility to fulfill our wishes and demands. We tend to love God mainly because He does something for us. With such a mindset, we quickly end up with exactly those kinds of responses if things do not work the way we envision they should. But real prayer is more, much more, than using God as a divine answering machine for our wishes, even if we wrap them in nice prayers that sound very spiritual. Often such prayers lack the most essential thing: enjoying the very company and presence of God. In my book Longing for God (see pp. 42-45) I have argued for a new and deeper understanding of prayer—a prayer “That Pleases God.” I invite every reader to have a look at this chapter in my book. I also wrote another chapter in which I deal with the tough issue of what happens when we pray and wait for an answer (see pp. 202-205). What I write in my book Longing for God might not answer all the questions we have about prayer, but I am convinced that it provides a great stimulus to practice prayer in a more meaningful way and to see prayer with new eyes from God’s perspective—a perspective that goes beyond a simplistic “Yes,” “No,” or “Wait” response. Do you have a favorite "prayer text" or EGW quote on prayer? If so, what makes it special to you? Currently one of my favorite Bible texts is Lamentations 3:22-24: “The Lord’s loving kindnesses indeed never cease, and His compassions never fail. They are new every morning. Great is Your faithfulness. ‘The Lord is my portion,’ says my soul, ‘Therefore I have hope in Him.’” This text is very special to me because it expresses how I have experienced God in the last couple years of my life. This quote has often been a great encouragement to me and has cheered me on to trust God’s amazing ways more fully and to believe that He literally has unlimited resources and means to accomplish His purposes and to provide whatever we really need. He can do things that have not even crossed our minds and that we do not even dream about. What a great God we serve! 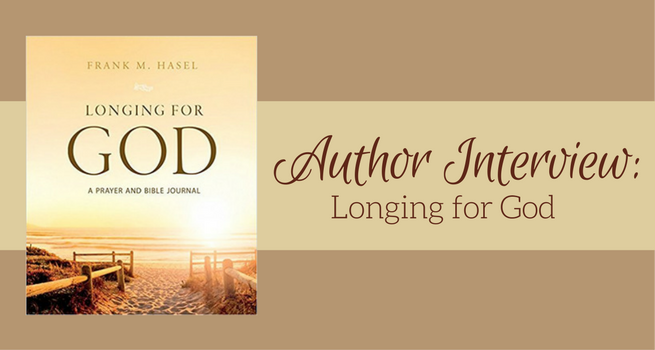 What are some of the features in Longing for God that sets this book apart from other journals? It focuses deliberately on God and His Word as the foundation of our relationship with Jesus and our spiritual life. It teaches you how to read and mark the Bible in a meaningful way. If you follow the simple Bible reading plan with passages from the Old Testament and New Testament for every day, you will have read through the entire Bible within one year. But you can also read at a slower pace at your own convenience. Longing for God is not just empty pages for journaling. At the end of every month, 12 times throughout the year, there are very practical suggestions that will invigorate your prayer life and spiritual walk. These are intended to be spiritual impulses rather than rigid prescriptions. They will inspire you to try out new things in your relationship with God and in your prayers. You will love it, and will be blessed. You will learn how to meaningfully pray for yourself, for your children, for other people, for missionaries, for your neighbors, etc. as well as learn how to pray with a prayer-partner or spouse. There are some chapters that deal with tough questions such as: What happens when we pray and wait for answers? Or how to get rid of bitter feelings and grudges? Or how to pray and fast. You’ll also find inspirational quotes about the Bible and about prayer sprinkled throughout the book. At the end of the book there are suggestions for special prayer emphases for each day of the week. Longing for God is written in such a way that it can be a blessing even to those who are not so familiar with the Bible or who are new believers. It is highly practical and easy to use and has an appealing layout and design. Longing for God is available now at your Adventist Book Center. Why not start 2018 with this powerful, inspiring book that will help you put your prayer life on a whole new foundation? Order a copy for yourself—and one for a prayer partner! Available on AdventistBookCenter.com and on Amazon. Dale E. Galusha is president of Pacific Press Publishing Association, where this interview originally appeared. It is published here with permission.